Chanting is part of the practice of most streams of the Buddhist tradition. 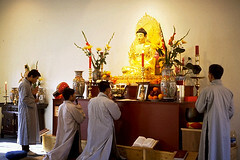 Theravada monks and Euro-American practitioners chant portions of the Buddhist scriptures in Pali. Practitioners of the Tibetan Vajrayana tradition also chant, and some of the monks are skilled in the multi-tonal chord chanting distinctive to that tradition. 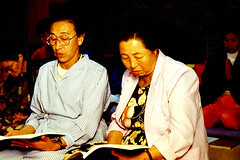 In America, Korean Son practitioners chant the Heart Sutra and other scriptures in Korean and, increasingly, in English. Chanting is not so much a way of reflecting upon the content of the scriptures as it is a way of concentrating and focusing the mind. The Pure Land traditions practice the devotional recitation of the Buddha’s name. Traditional Chinese Pure Land Buddhism emphasizes three elements of Buddhist life as being essential for rebirth in the Pure Land—faith, vows, and chanting the Buddha’s name. The Pure Land to which the faithful refer is a realm in which the Buddha Amitabha (in Chinese, Emituo Fo), literally “Infinite Light,” resides. To be reborn in the Pure Land can mean rebirth in that realm after one’s physical death, or it can mean rebirth here and now into a pure mind. Practitioners of Pure Land Buddhism have faith that chanting the name of the Buddha will bestow upon them the grace and blessing of rebirth into the Pure Land. Chanting forms the basis for both the community practice of the Nichiren Buddhists and their individual daily practice before the gohonzon, a mandala inscribed with the characters of this powerful name and enshrined on each member’s home altar.